It’s that time of the month again! No, not that time. Secret Recipe Club time! Hosted by Amanda over at Amanda’s Cookin’ it’s a great way for bloggers to meet, share, and make each others’ recipes. Every month each participant is assigned another blog and we can make any recipe from that blog. Then, all at once, we reveal our posts! Yup, it’s as fun as it sounds. Who doesn’t like being in a secret club? In June I made some excellent Lemon Poppy Seed Muffins from Connor’s Cooking and in July I made Darn Near Domestic‘s awesome Smoky Salsa. I took a hiatus in August and am excited to be back because this month I was introduced to another fabulous blog – Once a Month Mom. Once a Month Mom is an great blog put together by a talented group of women. Don’t let the title fool you – this blog is an incredible resource whether you’re a mom or not. It’s based on the concept of planning out meals for the month (AKA once a month cooking, freezer cooking, bulk cooking, and power cooking). They offer great recipes and tips that are helpful for just about anyone. For this month’s Secret Recipe Club I chose Kelly’s Cilantro Lime Chicken. Cilantro and lime make for one of my favorite flavor combinations and right now is prime lime season in Israel (that’s right, we can’t get limes year round!). I made a few changes to the recipe, namely I added lime zest and more garlic to the marinade and pan-fried the chicken instead of grilling. They offer instructions (which I left below) should you want to create a “freezer meal” but I couldn’t wait that long and allowed it to marinate for about six hours. This recipe is officially entering my frequent rotation. It was SO good! It was packed with delicious flavor and would complement any number of meals. I served it with black beans, sour cream, and tomatoes on a tortilla for dinner. The next day I sliced up the leftover chicken and added it to a salad. I also considered serving it with coconut rice. I seriously plan on making this again this week and always having it in my freezer to have on hand. It was that good. Heat grill or grill pan (or, sadly like me, just a regular pan) over medium-high heat. Add the chicken, working in batches if necessary (don't crowd the pan). Cook for about 6 minutes on each side depending on thickness, or until done. Thanks Giulietta! It really was very tasty. Such a great flavor profile for chicken!! It really is! You can’t go wrong with cilantro and lime in my book. Looks delicious! I would have served it the same way you did…I bet it tasted even better that way. It really was delicious. And I especially loved it with the beans and sour cream, it made it very Mexican – one of my favorite types of food! What a versatile dish! I can see why you liked it. Love the idea of it served mexican style. It really is versatile! You can go in any number of directions with it, although the cilantro and lime make Mexican flavors natural. Yes, I could not agree more!! PERFECT use for some of those limes 🙂 This looks so awesome, great flavors. Will most definitely be trying it out. It really was!! I just froze a bunch of lime juice in ice cube trays so I can make this (and anything else requiring delicious delicious lime) all year round. I know absolutely how this dish tastes coz I cook the Chicken Breasts almost the same way!! 🙂 I use green chilli paste and chilli flakes in the marination and serve them on a bed of Lemony Potatoes. Oooh I love the addition of chili paste and flakes! And lemony potatoes – oh my! I will have to try it that way next time! Wow, looks great. And so easy! Just bookmarked to my recipe folder – thanks! It truly is a great, easy recipe! And I love that it can be pulled together quickly or frozen to enjoy when you need it. Hope you enjoy! Ohh anything with lime and cilanto is amazing. Sound delicious – going to save this recipe for my left over chicken breasts. I agree completely! I really think you will like this recipe, hope you enjoy! That looks like some flavorful chicken right there! It was sooo flavorful! And I think the addition of lime zest gave it an extra boost. I love lime. Looks like a great make-ahead dish. Me too! It’s totally the ideal make ahead dish. I heart the SRC! It really does introduce us to fab new blogs (like yours!). I love cilantro and lime together, this recipe is a keeper! I know, I heart SRC too! This recipe is definitely a keeper, I’m so glad to have found it and all the other great blogs/recipes through src! I love that about SRC as well! It’s so much fun. I had Once A Month Mom last month for SRC and I chose the exact same recipe. It’s a winner! If you haven’t already, I’d love for you to check out my SRC recipe this month: Welsh Cakes. That is too funny! I wasn’t around for last month’s SRC so totally missed that! It really is a great recipe though. Heading over to check out your Welsh cakes now! I love the marinade used for this chicken, I’m with you on extra garlic, I love the flavor. The chicken looks great. I’ve saved this to try it out soon. This is my first time here, nice to meet you through SRC! I pretty much always double the amount of garlic in any recipe…what can I say, it’s just the way I was raised! 🙂 Great to meet you through SRC as well, it really is a fabulous way of bringing bloggers together! Ooh yes this would be great with any cut of chicken. Let me know how it turns out! It really is easy and delicious and I’m sure the kids would love it. I love the simplicity of this recipe! 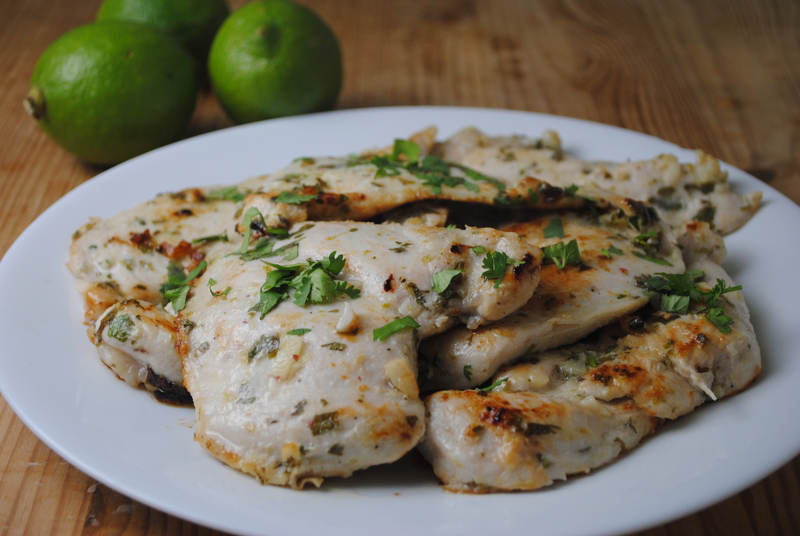 I’m a huge fan of chicken with cilantro and lime and yours looks great! I have some chicken thawed for our meal tonight and had been thinking of fajitas. Just decided to switch to your recipe with tortilla chips and homemade peach salsa on the side! I bet these would make for great fajitas as well! But it also sounds amazing with tortilla chips and homemade peach salsa! Great idea. A secret recipe club is a great idea! I love the chicken recipe! You can’t go wrong with cilantro and lime! It’s really a fun thing to be a part of! 🙂 And I so agree – no going wrong with cilantro and lime! Cilantro is a mood changer for me…I just perk right up! Haha, I’m totally the same way. I can’t imagine being one of those people that thinks cilantro tastes like soap! That looks and sounds so refreshing with the lime zest. I can see where this would be a great dish. Thanks Margaret! The lime zest definitely adds a refreshing element. What a beautiful blog you have! And that chicken looks delicious! Love the flavors in it. I tried a similar recipe which had tequila added to it, besides cilantro and lime. I bet this tasted as good! Thank you so much! Ooh I bet tequila makes for an awesome addition, I will have to try that. For some reason this past 10 days I’ve been making only chicken, and I have to try yours too. Great recipe, and mouthwatering photos..Love the name and I am assuming it gives more tangy flavor! Love this as all your wonderful dishes! I totally go on chicken kicks! It’s so easy and tasty. I think you will really like this one, it’s perfect for busy folks like you since you can marinade it and freeze for later if you like.